Combat on June 16, 2016 in Syria opened with a dawn raid comprised of Iraqi and Iranian troops against Jabhat al-Nusra positions in Maarata, southern Aleppo. The attack failed, with dozens of casualties reported, with one Iranian and three Iraqi service members being held as prisoner. A Jaysh al-Fatah offensive has succeeded in seizing over 90% of the territory around Khalasah in southern Aleppo. In Huways, in the Hama province, rebels filmed the destruction of a government tractor with a BGM-71 TOW missile. Further to the north, Syrian Arab Army (SAA) forces report gains in the Jabl al-Turkman mountain region, which borders Turkey. The SAA report taking the town of Kellaz near Latakia as well . ISIS captured the “Panorama” barrier in Deiz ez-Zor , while an attempted car bomb detonation by the same group on the Dudiyan front, in northern Aleppo, was foiled by militants from Faylaq al-Sham. Towards the evening, an IED placed near the home of journalist Hadi Abdallah and his cameraman Khalid Alissa detonated, reportedly injuring both men . Meanwhile, an aid convoy reached al-Waer delivering international aid to the stricken area outside of Homs. In the early hours of June 17, 2016 the Russian Air Force attacked a key Jabhat al-Nusra ammunition depot in norther Aleppo, destroying it completely. The depot was adjacent to a command-and-control center in the village of Babis. Pro-government forces, supported by Russian warplanes, retook more ground at the Syrian-Turkish border in the northern part of Latakia province. 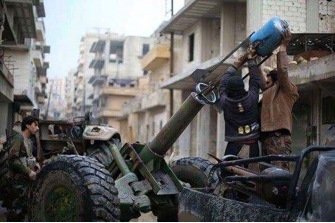 By June 17, the loyalists have liberated the villages of al-Shahrourah, Ain Issa and Hasam, the Tal al-Hayat hill, 3 high points (502, 559 and 469). Clashes are ongoing in the al-Rowaisi mountains.